Dwayne took video of Peyton playing in his exersaucer. Peyton loves to talk now. He also decided to share a dirty diaper with everyone. Hopefully this video will work. Enjoy!! My Grandad and Grandma from Arizona came for a visit. They were really looking forward to meeting Peyton. 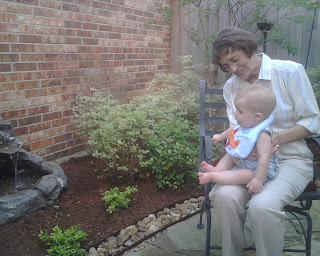 Peyton is their first Great Grandchild. We had a really good time visiting with them. 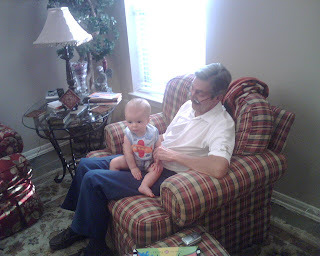 We enjoyed sitting around and watching Peyton. 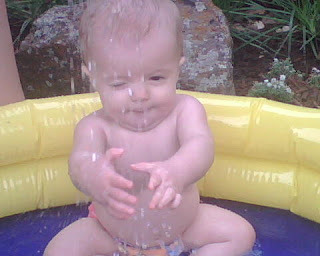 Peyton had a good time in the baby pool in Grammy and Papa's backyard. Great Grandma, and Grammy went to watch Peyton at Gymboree. Peyton enjoyed showing off! We are so glad that they came to see us. Enjoy the pictures!! Peyton's first time at the pool. We took Peyton to the pool this weekend. He did not like it at first, but after a while he loved it. We are so glad that he likes it. All Russell's must like the water!! We are not here to have fun, we are here to learn how to swim (ski)!! ( this was a quote that my family always used on me at the lake ). Peyton will be a great little swimmer by the end of the summer. Enjoy the pics!